No gameroom can be considered complete without a foosball table! Foosball is one of the absolute classic indoor games. Finding a decent foosball table is harder than it might seem, though. Of all the gameroom equipment you can buy, a foosball table has the most moving parts, which means the most opportunities for something to break or malfunction. That’s why it’s so important to find a high-quality setup! We’ve put lots of time and effort into reviewing all sorts of foosball tables, from the ultra-cheap models to the premium, tournament-grade setups. To help you narrow down your search, we’ve compiled all our favorites here. There’s something for everyone–no matter your budget, space limitations, or skill level. 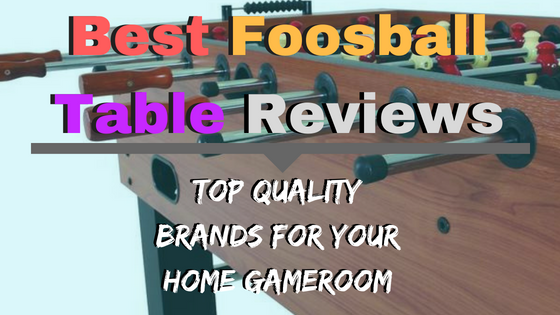 Read on to see all our favorites and to find out why we think they’re the best foosball tables on the market! KICK is one of the most exciting brands in the foosball market right now. They’re relatively new to the game, but have quickly established themselves as a high-quality, innovative manufacturer. What we love is their wide range of options for every budget. 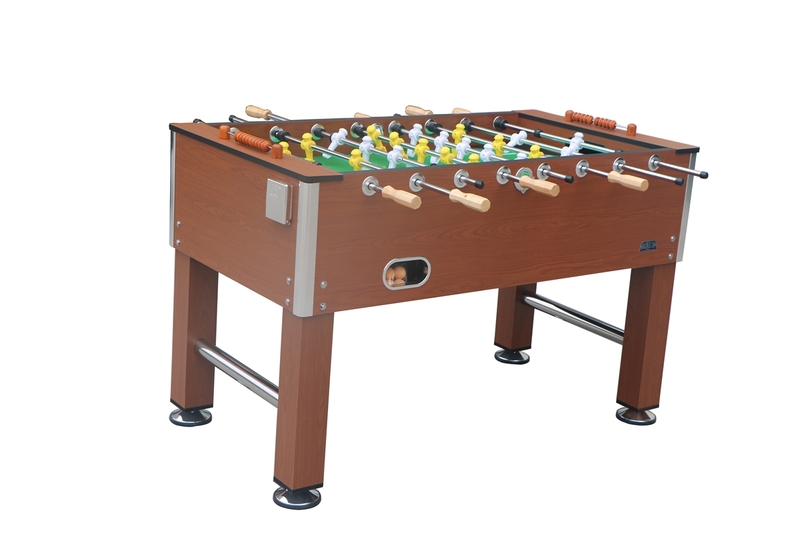 While there are certainly fancier models from brands with more name recognition, KICK foosball tables play absurdly well for their price class and are backed by an outstanding warranty. This Glory model is a compact foosball table that’s ideal for folks on a budget, or for those shopping for their first table. It’s much more rugged than other inexpensive options. It also has better construction quality overall, which means that everything lines up more precisely and plays more smoothly. We think it’s the least you can pay for a high-quality table that plays well without falling apart in a hurry. You’ll need to do all the assembly yourself, but it’s not very difficult and KICK has refreshingly good quality control, meaning everything lines up and fits together as it should. Best of all, it’s covered by the same lifetime warranty as the pricier KICK models! They’ll even send you replacement balls for free. How many companies are that pleasant to do business with these days? This KICK model, the Splendor, is our budget recommendation to folks who want a full-size table. It’s our recommendation to the average buyer who wants a high-quality, full-size table that won’t break the bank. While the Splendor doesn’t have the kind of fit and finish you see on premium models, it’s solid, simple, and reliable. All the parts are nicely machined and they work well. At this price, we’re totally willing to forgive the chintzy wood veneer and particle board, since it all feels so rugged to play on! What do you miss out on by choosing this over the premium Tornado models below? The Tornado’s have American build quality, for one. They’re rock-solid and commercial-grade in every sense. You might not see a huge difference in build quality up front, but you see the difference after a few years of competitive play. 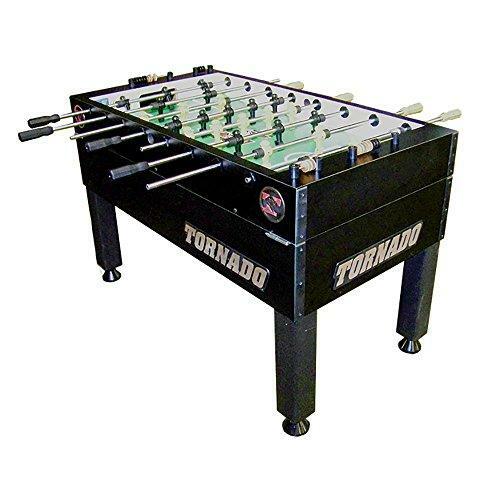 Tornado foosball tables simply work better, for longer. 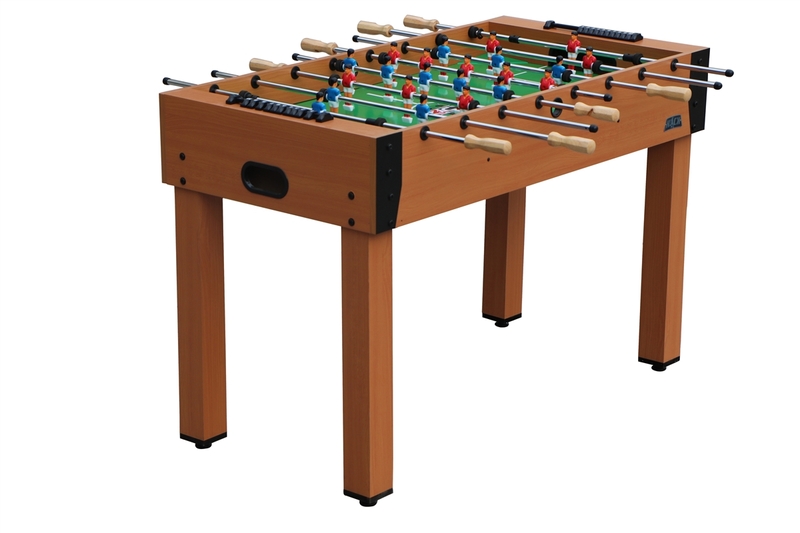 Garlando foosball tables are our go-to’s for premium compact models. Garlando is an Italian manufacturer with a long history of making extremely playable, reliable tables. The G-500 is no exception! While it’s small, it’s built like a tank and plays fantastically well. We also love the natural wood look, which stands out from the average black or brown American tables. The G-500 is made entirely in Italy, with a 1” cabinet that’s as sturdy as the American Tornado models below. It’s mounted on powder-coated steel legs (4” thick) that ought to last for decades. Every component is built to a T, from the high-grade telescopic steel rods to the nylon-encased ball bearings. If you want to have a small table, we don’t see any reason to spend more. We think this plays just as well as the Tornado’s. Just don’t plan on using it for tournament play. If you want the best of the best in a full-size foosball table, you’re looking at a Tornado. 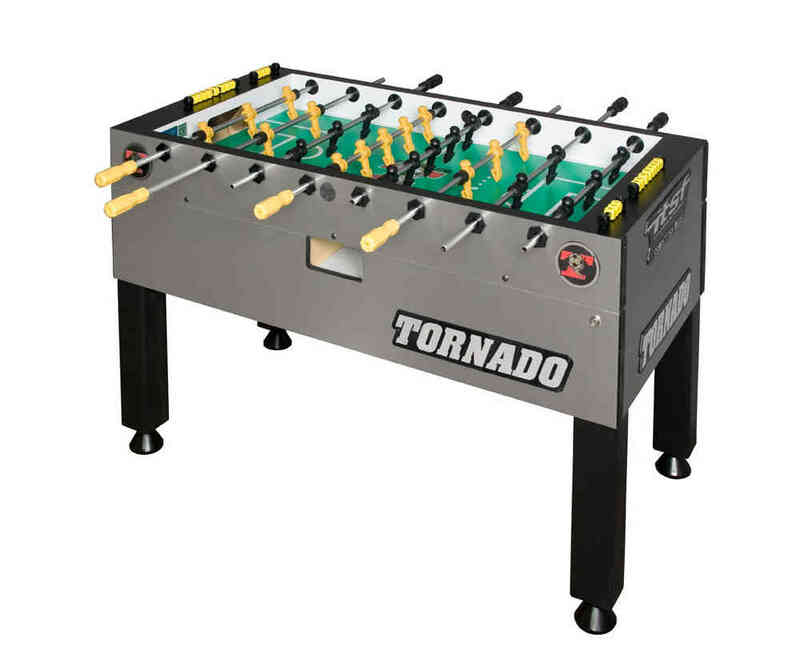 Tornado is by far and away the top manufacturer of tournament-grade, full-size tables. All their models are made entirely in the USA. They’re world-class by any measure. We recommend the Tornado Sport to most folks who want a premium full-size cabinet. Think of it as an upgraded alternative to the KICK Splendor above. The two are the same size and look fairly similar, but the Tornado is even heavier-duty and has lots of small tweaks and improvements to justify its extra expense. The differences might not be obvious to a casual player, but advanced folks will appreciate them. The Tornado Sport should also last longer, even though it has a shorter warranty period. Our ultimate recommendation, the Tornado Tournament is an absolute dream of a foosball table. It’s extremely expensive and overkill for the vast majority of people, but it’s the ideal setup for competitive folks who want the best of the best for their gameroom. It’s the official table of the International Table Soccer Federation and used in nearly all official competitions. The Tournament is the same size as the Sport, but it’s upgraded with a commercial-grade cabinet and counterbalanced players (something that’s not standard on the Sport). The handles are grippier, the ball control is even more precise, and everything is insanely heavy-duty. Do most people need something like this? Absolutely not. If you play for hours a day and want something you’ll never have to replace, the Tournament should be right up your alley. One of the biggest differences between various foosball tables is the size of the playing area. You’ll find tables available anywhere from 48” to 56”. There are some smaller sizes available, but we don’t think they’re worth considering. They’re just too compact to be any fun. Before you start making any decisions about which model to buy, think about what size foosball table you can reasonably fit in your gameroom. Be sure to leave a few feet of space at each end and around the sides! This is especially important for folks who are tight on space. Figuring out the maximum size you can accommodate will help you narrow down your options. 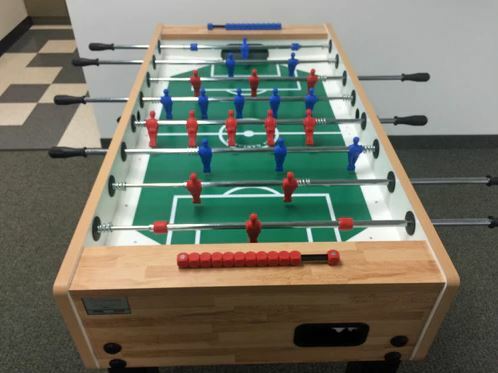 You can pay anywhere between $200 and $2500 for a foosball table, depending on the size and quality of the model you choose. That’s a vast range, so it’ll help narrow down your options if you set yourself a limit of how much you want to/can afford to spend. We don’t think there’s any reason for casual players to spend more than $750. You can easily get a good-quality setup in a full-size cabinet for that amount. If you’re passionate and play often, you might consider spending $1000-$2500 for a top-notch, tournament-grade model. Just be aware that these models are overkill for the avst majority of players. Any decent foosball table should come with at least a year of warranty coverage, if not more. There are a lot of moving parts on these contraptions, so you want some time to find any potential weak points in the design and get them resolved. A high-quality foosball table is a large contraption, and it’s a bit tricky to install in some spaces. Most models ship partially-assembled, which makes them easier to get up stairs and around corners. Still, you might consider white-glove delivery/assembly to make your life easier. You should also make sure you’ve got the help you need to carry the table around, since they often weight a few hundred pounds. To find out more about any of the foosball tables you’ve seen above, click on the links in our reviews! That’s the easiest way to check current prices, get all the key dimensions, and see your color/finish options. Don’t forget to grab some extra foosballs for your gameroom! You can find our current recommendations for the best foosball balls here. You might also enjoy our guide to the best foosball coffee tables! In it, we reveal our favorite factory-made models and offer some suggestions for DIY alternatives.